There are books I feel sorry I didn’t like: I could see huge work, immense creativity and undoubtful talent behind it… unfortunately, they still didn’t work for me. The Leopard is one of these books and it upsets me. I challenged myself to finish the book even though I was on the verge of giving up as early as the fiftieth page. I expected to feel rewarded at the end but actually, I was just relieved it was over. Let me explain. 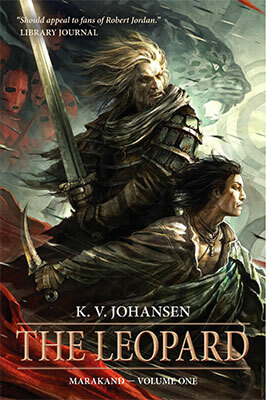 The Leopard is beyond-epic fantasy. It is set in a vast empire recalling the Middle-East in a time of kingdoms, warships and magic. The universe of Marakand is impressive: cities and kingdoms, people with various languages, customs and beliefs, a whole hierarchy of divinities from the Old Great Gods to water spring and hill gods, from devil to demons to wizards. Everything is depicted with so much details that you almost get convinced it actually exists. I felt the lore of Marakand was much bigger than the author could possibly explain within four hundred pages: The Leopard is certainly a massive worldbuilding achievement. Unfortunately, it might also be the book’s downfall: there is simply too much to take in and I didn’t find K.V. Johansen made it easy for me. The Leopard is written in long, dense, over-detailed sentences, in which trivial information often comes to interfere with the main story. I found it impossible to relax when reading this book: it required so much concentration to get the important information through its over-flowery style! It was sometimes equally hard to simply follow K.V. Johansen’s line of thought: a long sentence would simply switch focus several times on the way. Furthermore some characters were difficult to decipher because they were supposed to talk in babbles, although what they say was essential to understand the story. Basically, The Leopard‘s writing was unpleasant to read for me: I often felt overwhelmed, confused and forced to sort myself the trivial from the important. But that’s actually not my main issue with the book. See, The Leopard is divided in two parts. The first one follows the cursed assassin Ahjvar, his friend Ghu and princess Deyandara. Then, the second part discards them and introduces such a huge number of new characters I won’t even attempt to list them here. Just when I started to connect with the first three characters (and yes, it took me a while! ), the story switched to “part two” and my three heroes basically disappeared. The new characters in this second part weren’t uninteresting but I just couldn’t make myself care about them: I wanted Ahjvar, Ghu and Deyandara back. I had no interest in starting another story at that point and fill my head with more characters and back lore. Considering The Leopard is only the first part of a two-book series, I still have hope that Ahjvar will come back as a protagonist in the second book. Nevertheless, I would have appreciated if the first book had provided some kind of closure. There were indeed a climax at the end of The Leopard but no closure. The whole novel just seems like a huge introduction to the next, in which hopefully the big battle will take place. For all these reasons, I had trouble rating The Leopard. The world is indeed impressive, many characters are fascinating and the multiple layers of divinities and magical beings are fascinating. Marakand was really well depicted and I felt like I was walking in its dusty streets with my very own feet. But cold hells — as they say in the book — it was too hard to read: the style is too dense and too confusing. It was frankly unpleasant. I wish I knew what will happen in the second volume but I seriously need a rest before I commit to 400 more pages of this. Confusing and 400 pages?! Gosh, that must be exhausting.